Level Quality Level Manager and GNM Jobs. Selection for this Staff Nurse, Lab Technician jobs of DHFWS Howrah District recruitment is based on previous work experience, Merit in qualifications, short list is prepared. Shortlisted candidates only called for documents verification. 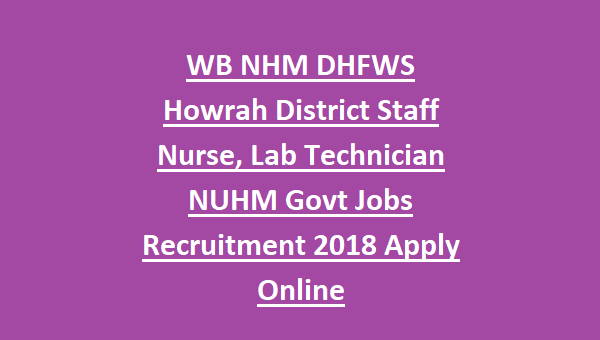 Last date application form submission online for this NHM DHFWS Howrah District Staff Nurse Jobs is 15-11-2018. There are total 71 vacancies available in this DHFWS Howrah Recruitment 2018 Notification. 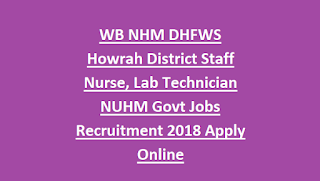 DHFWS Staff Nurse, Lab Technician recruitment of Howrah District see the below given details. Last date to apply online for this DHFWS CMHO Howrah District is 15-11-2018. There are total 71 vacancies available in this District Health and Family Welfare Samiti. Selection for this Staff Nurse Jobs and other vacancies will be based on merit in qualifying exam and personal interview. Online applications only accepted for this Howrah District Vacancies in NUHM program and other programs. Interested candidates can apply online before the closing date of 15-11-2018. Official website to apply online is http://onlineapplication.healthyhowrah.org/#loaded.